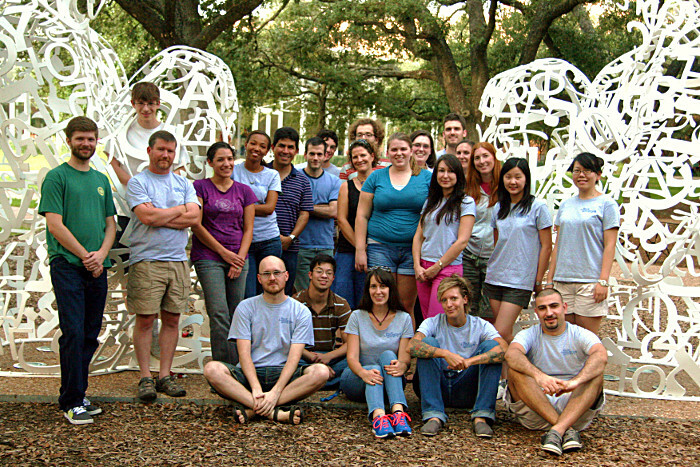 Established in 2005, the Rice Linguistics Society (RLS) is a student-run organization at Rice University in Houston, Texas. RLS publishes the Rice Working Papers in Linguistics, and organizes a Biennial Meeting that brings linguists from around the country to present their research. RLS is closely connected to Rice’s Department of Linguistics. Membership is open to all (undergraduates, graduate students, and faculty of any department), whether or not one is affiliated with the department. RLS organizes many events on campus, including reading groups, workshops, potlucks, and fundraisers. Our most visible event is our Dialectal Diversity Day, where we use fun activities to foster an appreciation for the many different language varieties on campus. To keep up with our goings-on, you can view our events calendar, visit our group page on Facebook, or subscribe to our mailing list. We wanted the RLS logo to be associated with both linguistics and an owl, the symbol of Rice University. We also wanted it to be simple and crisp, using only two colors, and usable at any scale. Therefore, the main element is composed of the IPA symbols ð (eth), v, and ɓ (b with hook), to create an owl’s face. (Some say: face of an owl with a brow ring.) The acronym RLS is located below, in negative for the sake of balance, and a square frame was added to provide an integrating and bounding element for the whole.